Merry-Go-Round is one of the most recognisable works in Tate's collection, but how did the painting come about? A chance visit to the annual Easter Fair on Hampstead Heath in April 1915 inspired Mark Gertler with ‘wonderful ideas’ for paintings. ‘Multitudes of people. Bright feathers, swinging in and out of the clouds in coloured boats’, and ‘a Blaze of whirling colour’ he observed. 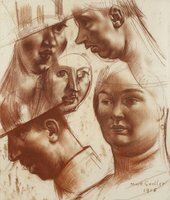 He completed a painting, Swing Boats 1915 (now lost), by August, and, the same year, also finished a study in pencil and red chalk for Merry-Go-Round, depicting two male and three female heads. 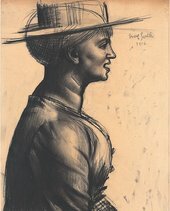 The drawing was sold that November for £5 to John Drinkwater, a member of the circle of poets known as the Georgians that was centred on the art patron Eddie Marsh. 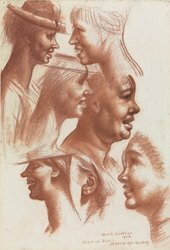 There are three further related studies from 1916: a pair of charcoal drawings of women in profile, and a sanguine of six open-mouthed female heads that moves closer towards caricature. The painting was executed against the backdrop of the First World War in a climate of mounting hysteria. Following the introduction of the Military Service Act in February 1916, Gertler, an instinctive pacifist, presented himself ‘trembling in every limb’ at his local recruiting office, only to be refused on account of his Austrian parentage. ‘What luck!’ he told fellow artist Dorothy Brett, ‘Now I am free to go on with my work.’ From then until July, he was absorbed in his ‘large and very unsaleable picture of Merry-go-Rounds [sic]’, refusing to show it to anyone, including Vanessa Bell who called at his studio in March. Although Gertler extensively reused canvases in this period, in this case not only did he use a fresh canvas but X-rays also reveal that he made only minor changes as he worked. Its reverse, however, he covered in multiple, multicoloured brushstrokes while experimenting with colours. A little-known preparatory study for Merry-Go-Round has recently been uncovered by X-ray beneath a Garsington landscape. 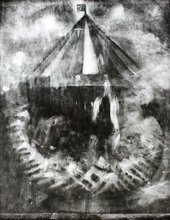 It shows an earlier version of the carousel, its fuller canopy topped by a flag, and rudimentary horses galloping round then base, their criss-crossed legs forming a rhythmic pattern. In the final painting the flag is omitted, the canopy reduced, and the horses – now much larger – are fully realised: joined nose to tail, they plunge forward, forelegs raised like ‘a cluster of cavalrymen’s lances’, their hind legs kicking out like rifle butts and their teeth bared. The jaunty feathers on the women’s hats resemble the horses’ battle-alert, pricked-up ears. The soldiers’ distinctive, brassbuttoned scarlet tunics, suggestive of a more traditional military costume, are largely invented, perhaps based on toy soldiers; their round ‘drummer-boy’ hats reinforce the carousel’s circular motion. The inclusion of sailors may have been prompted by news of the Battle of Jutland, the largest naval battle of the Great War, which took place from 31 May to 1 June 1916. ‘Lately’, he wrote, ‘the whole horror of the War has come freshly upon me.’ As Gertler put the finishing touches to the painting, he must have been aware of the full horror of the Battle of the Somme: his riders whirl endlessly, unable to stop or get off, their mouths open in an unending scream. The stylised clouds rain down around them like bombs or Zeppelins, bursting in the sky ‘like streak[s] of light … shots bursting all round’. Sarah MacDougall is Head of Collections and joint Senior Curator at Ben Uri Gallery and Museum. 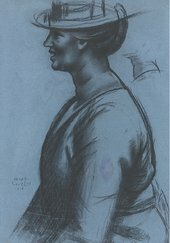 She is the author of a biography (2002) and a forthcoming catalogue raisonné of Mark Gertler (Yale University Press), and co-curator of the Mark Gertler display at Tate Britain, which features both Merry-Go-Round and its studies.